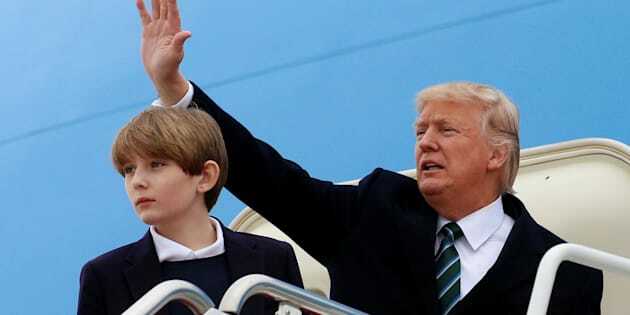 President Donald Trump and his son Barron. A series of books written in the late 19th century&nbsp;by Ingersoll Lockwood concerns a character named Baron Trump -- who finds a time portal in&nbsp;Russia thanks to&nbsp;a man named Don. Lockwood’s series of 19th-century children’s books includes: Travels and Adventures of Little Baron Trump and His Wonderful Dog Bulger;Extraordinary Experiences of Little Captain Doppelkop on the Shores of Bubbleland;Wonderful Deeds and Doings of Little Giant Boab and His Talking Raven Tabib; and Baron Trump’s Marvellous Underground Journey.